Regardless of the food at La Tour Eiffel Restaurant, there’s no denying the room and the view is about the best in town. 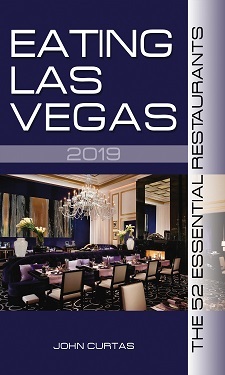 We’ve always said the Bellagio should charge Jean Joho (and Lettuce Entertain You, his corporate partner) a royalty for the free show it provides patrons of his restaurant. The interior and the view are so spectacular, and the place is so romantic, and the service is so top-notch, they almost make us forget how overpriced the wine list is. But is the food worth it? Has the food improved? The view is also great at the other side, especially at Olives. But as you know, everything at Olives goes downhill from there. Here’s a thanks note for sharing these pictures of the venue. I’m reluctant to be too epicurious in Vegas’ Eiffel since le menu I recall from Pari(s) didn’t produce a oui for me. Pardon my French.